Each week this Fall and Winter we will be sharing a Small Grant School Story. These stories offer a peak into the inner workings of a day at a small grant school, as well as being a repository of all the information we have gathering while working with the school. 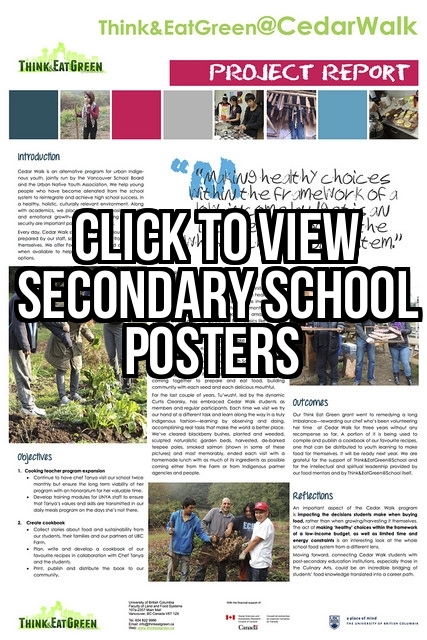 Each will contain vital info, the school’s goals for the TEGS program, project posters, as well as any student feedback, media links, pictures, and videos we have collected over the years. As each ‘story’ is posted, it will find it’s permanent home on the complete list of TEGS Small Grant Schools. Our first instalment has us visiting Captain Cook Elementary School in South Vancouver, as they install new planter boxes and a three-bin-compost system. 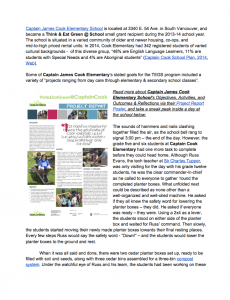 Click here to view & download the CAPTAIN COOK ELEMENTARY SCHOOL story, or read on below. 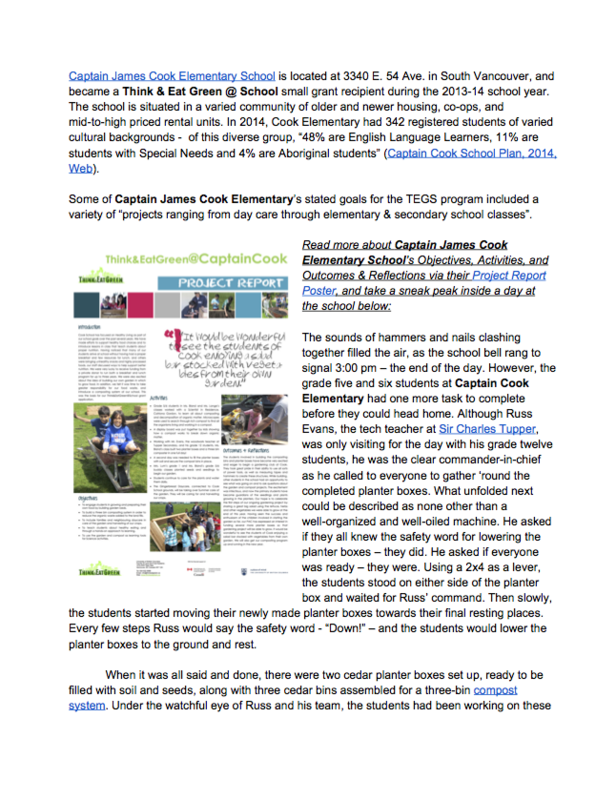 Captain James Cook Elementary School is located at 3340 E. 54 Ave. in South Vancouver, and became a Think & Eat Green @ School small grant recipient during the 2013-14 school year. The school is situated in a varied community of older and newer housing, co-ops, and mid-to-high priced rental units. In 2014, Cook Elementary had 342 registered students of varied cultural backgrounds – of this diverse group, “48% are English Language Learners, 11% are students with Special Needs and 4% are Aboriginal students” (Captain Cook School Plan, 2014, Web). Some of Captain James Cook Elementary’s stated goals for the TEGS program included a variety of “projects ranging from day care through elementary & secondary school classes”. The sounds of hammers and nails clashing together filled the air, as the school bell rang to signal 3:00 pm – the end of the day. However, the grade five and six students at Captain Cook Elementary had one more task to complete before they could head home. Although Russ Evans, the tech teacher at Sir Charles Tupper, was only visiting for the day with his grade twelve students, he was the clear commander-in-chief as he called to everyone to gather ‘round the completed planter boxes. What unfolded next could be described as none other than a well-organized and well-oiled machine. He asked if they all knew the safety word for lowering the planter boxes – they did. He asked if everyone was ready – they were. Using a 2×4 as a lever, the students stood on either side of the planter box and waited for Russ’ command. Then slowly, the students started moving their newly made planter boxes towards their final resting places. Every few steps Russ would say the safety word – “Down!” – and the students would lower the planter boxes to the ground and rest. When it was all said and done, there were two cedar planter boxes set up, ready to be filled with soil and seeds, along with three cedar bins assembled for a three-bin compost system. Under the watchful eye of Russ and his team, the students had been working on these projects all day, and every single one of them had safely used the machinery and tools without incident. With the funding from the Think&EatGreen@School grant, Charmian and her team were able to purchase the wood needed for the two planter boxes, as well as the soil to fill them. 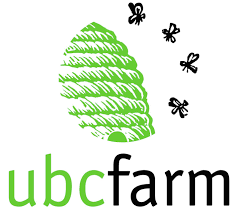 The plan is to eat what is grown in the boxes, and the hope is that the gardens will be accessible to any student or teacher who wants to use them. The onsite daycare has even volunteered to take care of the planter boxes during the summer, a time when many schools face the challenge of watering what has been planted while the students are away. In preparation for the compost bins, and as part of the movement towards integrating the complete food cycle into the classroom, two of the grade six classes have already done two workshops on composting, and Charmian’s class will meet with their buddy class of grades one and twos to teach them about composting. 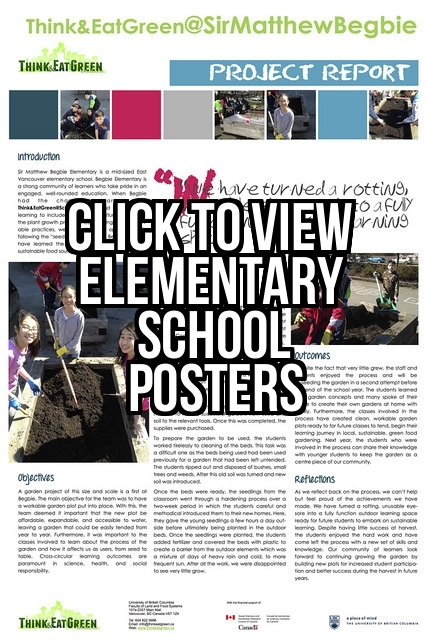 The idea is that they will make a display board on the composting system, and about decomposers, so that when the composting bins are put in the lunch room, all of the students will be able to see how composting works and why it is an important part of creating a sustainable food system. It is a pretty amazing thing when students can work together to build something that they are proud of – especially if it will be sustained by future classes and the surrounding community. When Russ finally had the students set the boxes down at their final resting spot, it was a clear moment of pride for all of those involved. And, best of all, that’s only the starting point for how the gardens at Captain Cook Elementary will shape the community. Wait until seeds are planted, veggies start growing and compost is made!